Course and membership content planning, finding flow, and the copywriting super skill with Memberium’s Micah Mitchell in this episode of LMScast with Chris Badgett of the LifterLMS team. Micah shares his journey with going from owning a lawn mowing service to entering the IT world and designing a software for Infusionsoft and WordPress users called Memberium to fill the demand he noticed while working as a freelancer. Memberium is a membership plugin for WordPress. It was originally built to connect to Infusionsoft, and later it expanded to also integrate with ActiveCampaign. Memberium isn’t designed to create the entire membership experience. Rather it acts as a middleware, which is a software that acts to integrate two things together, in this case Infusionsoft and WordPress. Infusionsoft is a CRM (Customer Relationship Management) sales tool, and it is an all-in-one system. You can use it to manage your sales team, sales opportunities, pipelines, automations, affiliates, eCommerce, and more. ActiveCampaign focuses on the marketing campaign piece of your business, so ActiveCampaign tends to work best when you tie it in with several other tools. One of the most common uses of Memberium and Infusionsoft is to have Infusionsoft engage with the student when they finish a section, lesson, quiz, or course in LifterLMS. A great strategy you can use when building your courses is to lay out your course on index cards or pieces of paper and go through them in chronological order as your students will, rather than constructing the course as a mapped out diagram. This strategy will allow you to see what parts of your course you need to make clearer and what content you may need to break down into smaller modules. Micah and Chris talk about how solid fundamentals for what delivers value in your online course or business in general is important for success. With all of these tools that are available for WordPress, LifterLMS, and social media, it is important to focus on the minimum viable product (MVP). Head to Memberium.com to learn more about how you can integrate Infusionsoft with your LifterLMS or other WordPress sites. If you want to reach out to learn more about Memberium or any of the things we went over in this episode of LMScast feel free to reach out to Memberium support even if you don’t use Memberium. Also go to LifterLMS.com to find out more about how you can use LifterLMS to build your own online courses and membership sites. If you like this episode of LMScast, you can browse more episodes here. Subscribe to our newsletter for updates, developments, and future episodes of LMScast. Thank you for joining us! Chris Badgett: Hello, and welcome back to another episode of LMScast. My name’s Chris Badgett, and today I’m joined by a special guest, Micah Mitchell, from Memberium. How you doing, Micah? Micah Mitchell: I’m doing well. Thanks for having me on. Chris Badgett: It’s really cool to have you on the show, because I know our paths in some ways are very similar. We’re in the membership, online course ecosystem, and our products have been around for about four years. So we have a lot of history, and we’ve seen things evolve. I’m really excited for this conversation. Can you describe for the listener what Memberium is? And I know you have two versions, one’s for Infusionsaoft and one’s for ActiveCampaign. If you can touch on the difference between those two different CRNs. Micah Mitchell: Yeah, sure. Memberium is a membership plugin for Word Press. We originally built it only to connect to Infusion Soft, and then later expanded a bit so it also connect to ActiveCampaign. Our goal isn’t to create the entire membership experience, we’re really more middle ware. For those of you not familiar with that, we’re kind of an integration piece. Infusionsoft, the difference between it and ActiveCampaign real quick is they both do a email follow up. They both do campaign. Infusion Soft has a campaign builder, ActiveCampaign obviously is mostly campaigns. Infusion Soft just does more. ActiveCampaign very much specializes in the campaign piece, and if you wanna do e-commerce or affiliates or some of these other things, you would plug something else into ActiveCampaign. Infusion Soft really got going and became big by being an all in one solution where they’re a CRM, they’re a sales tool, you can manage your sales team, manage sales opportunities and pipelines, their automation, their affiliates, their e-commerce. Infusionsoft puts it all together. They try to do it all in one system. And ActiveCampaign does mostly just the capaign piece. There is a contact record, but it’s not as in depth. But then people do a great job with ActiveCampaign of plugging in other tools that they like even better. So somebody with Infusion Soft, they might use everything Infusionsoft, and it works great, because it’s all in one. Somebody with ActiveCampaign, they’re gonna go for the best shopping cart, the best of each type of tool, and glue them all together. A little bit different philosophies, but a lot of people – for us anyways, from Memberium’s perspective, the clients are very similar. In fact some of them, they’ll move their exact same business from Infusion Soft to ActiveCampaign or the other way and do the same thing, just they’ll add on some tools or remove some tools, depending on which way they’re going. Chris Badgett: That’s awesome. Can you explain what you mean a little more by middle ware for what Memberium is? Is it middle ware? Micah Mitchell: Yeah. It’s software that’s between two things. It’s in the middle of two things. With Infusion Soft and Word Press, a lot of people with their website, they want their customer to be able to log in and to only be able to access pages based on their Infusion Soft records, whether the person’s bought or subscribed to a certain list or whatever, a different set of pages or different things on those pages will be displayed. Memberium’s doing the communication between those two. Memberium isn’t a tool where you create a page and design a page, you do that in Word Press, but Memberium’s the tool that controls which pages and which portions of the page and so forth are visible. It’s kind of a behind the scenes piece that passes data back and forth between the two. Chris Badgett: That’s awesome. For example, if you’re using Memberium for Infusion Soft with Lifter LMS, you can control access based on tags or apply tags based on certain things happening in the LMS. For the more advanced user, who wants a lot of activity happening and control happening from the CRM Infusionsoft, that becomes possible through your middle ware. Micah Mitchell: Yeah, exactly. Lifter’s a great example where you guys do control the look and feel, and when somebody completes a course or passes a quiz or whatever, that’s where Memberium can pick up on that activity and pass it back to Infusionsoft to say hey, they were in a campaign talking about finishing module 1. Well, we just got a notification from Lifter through Memberium to Infusion Soft that they’re finished, so let’s go ahead and stop that campaign, start another campaign to encourage them to finish module two is a typical scenario. Chris Badgett: That’s awesome. Let’s do a little personal history lesson here. Tell us a little bit about your back story, because similar to me, if I’m understanding correctly, you’re not a developer yourself. You don’t know how to write code. I don’t know how to write code. But we run software companies. How did that happen for you? Micah Mitchell: I would probably, similar to your story, it’s a partnership. My background went … Once I had quit my job when I was 18, 19, I actually started a lawn care company, which is kind of funny, because I was sick of being in the office. I was doing a sales/IT job. I wasn’t really into IT but I knew more about it than the other people. When I quit, I went out mowed lawns and actually bought Infusionsoft for my lawn care company to manage it. Then winter came. I tell this story sometimes and I sound so stupid, but basically winter came and I was like, “Oh, I can’t mow lawns anymore,” so I kinda fell back to IT. It was just a good time – this was back in 2006 – when there weren’t really any Infusionsoft experts. When Infusionsoft figured out, “Oh, this guy knows how to build websites and do some of these things and he knows Infusion Soft,” they would get that request all the time. “Hey, I need somebody to build me a website who knows Infusion.” That’s how I got started. Then I spent about 10 years doing all sorts of consulting for Infusion Soft users. It eventually came around to doing software because a lot of them would ask for the same custom integration. If there was any sort of plug ins out there, they would say, “Hey, can you connect Infusion Soft to WordPress?” I’d get somebody to do that custom, and over a bunch of iterations and a whole bunch of sloppy history, eventually figured things out to where we started Memberium about four years ago, and then I’ve been laser focused on that. So I stopped doing general Infusion Soft consulting, just did membership sites for Infusion Soft users, and now just membership site software for Infusion Soft users. That’s kind of the short version. But it’s funny, because when I look back at, there wasn’t any plan, it was like stumbling towards something. Now that we’re here I love it, and I can draw on some of that experience. But that’s kind of how it happened. Chris Badgett: That is awesome. I love that story, and I do share something similar. When I left the job I had in Alaska, I was hobby building websites, learning websites, and I kinda stumbled into. Then people started asking to pay me to build websites. I heard the same … This is very compressed but I heard the same requests over and over, and started specializing in membership and online course websites. Heard the same stuff over and over, and a product was born out of those requests over and over and over again. So it’s a very similar story, it’s really interesting. I think I heard you on a podcast a while back, somewhere, or on a video or something about content planning for a membership site and index cards. Can you share that gem with the LMS Cast listener? Micah Mitchell: Yeah. I’ll give you a little bit of how it happened, because it’s again one of those things that just naturally came up. I was trying to plan out some of my own content, so I would try mind map software, and I would try slides, and different ways of outlining content. I don’t know exactly when or where it happened, but I think it was because I was traveling a lot, I got a stack of index cards, so I started planning my content on the index cards. Basically, I would lay the index cards out on the table like a mind map and try to write, “Okay, what’s in Module 1, what’s in Module 2,” and go out and try to plan out a full curriculum. Then I’d have to put them in my pocket and go again. So after taking them in and out of my pocket enough, then I would be on a plane, for example, and instead of being able to spread them out, I’d have them in a stack, and I’d start going through them one at a time, like taking the top card off and putting it on the bottom, and basically realized that this is how the user goes through the content. As the content creator, you see this map, and I like to use, I guess it’s a metaphor of the bug in the rug. If you think about a rug that you’re looking down on that’s sitting on the floor, from above you can see the pattern and you can see all the colors and everything fits together, but if there’s a little bug down in that rug climbing through the fiber, it has no idea. It just sees the walls of fiber around it and looks around and sees whatever’s in front of it. Going through the cards, just like a deck of cards where you take off the top and put it on the bottom, it’s like, okay, this is how the customer sees my content, one page or one video at a time. And honestly, even if they did see the whole thing, it’d probably just overwhelm them, and they wouldn’t really know yet how it fits together. So I started an exercise with note cards, and have done this at live events a few times where we pass around stacks of note cards to everybody, and it basically goes where you first of all come up with the title of your course or whatever, and you put that on one card. Then you break it up into three sections. You say, “Okay, whatever it is, I’m gonna break it into three sections,” whether that’s beginner, intermediate, advanced, or whether it’s three parts of it. For example, when I would teach Infusion Soft, it was, well, there’s the marketing, the sales, and the fulfillment. There’s different ways you can split it up, but then within each of those sections, splitting it up again into three sections. Okay so marketing, what are the three sections of that? Maybe traffic, capturing leads, delivering lead magnets, sales, how do you split those up. Then within each of those again splitting it up three times. What it helps the site creator to do is to break big areas of content down into small areas. Because basically at each section you can break it down again, even a lead magnet. Okay, how do we break that down? Then, even if you say, “Okay, one of the sections of the lead magnet is the copywriting,” or whatever, e-books versus webinars versus something else, break that down. You only need to go as far as you want to, but pretty much you can take a big piece of subject matter, and if you just split it a few times, like three by three by three, pretty soon you’ve got 81 or so things which then become the videos. Then what you can do is you … Let’s say you have 81, and you shuffle them altogether. You’ve broken it down three or four times by threes. That’s perfect because those smaller chunks, they’re easier to consume on mobile. When you have a learning management system like Lifter, then as people are going through, they can get a better perceived sense of progress. They can have something check off more often. If they only have five minutes to watch, it’s not like they watched five minutes of a 20-minute video and have to remember where they are. They just checked one off and they can come right back and continue on the next one. It’s good for breaking it down small. It’s also good, again, because as you go through the cards and … Sorry, this is a long winded answer, but as you go through the cards one at a time, you can start to get a sense, if you step back from the content creator perspective and look at it as a user, you can start to get a sense of, “Okay, as I’m going through these cards, what’s missing, are some of these in the wrong order, do they need an intro to this section,” and right from the title card, you realize, “Okay, let’s add in a card for welcome video,” then maybe welcome video per section, and then maybe a wrap up video at the end of each section. I als like cards because if you’ve written on one and wanna change title, you can just cross it out and write another one, or just chuck the card and get another one. I worked through a lot of my content this way and, like I said, have taught this a few times. I think it’s just a valuable exercise to organize your mind as the content creator, but then also go through the experience as a user, and experience going through and asking yourself, again, what’s missing, what’s out of order, and especially how are they going to be feeling as they go through it. Like, “At this point am I overwhelmed, am I lost, am I tired even, has this been a lot?” Going through it that way, then you can slip in some pieces that then when you do, however you put the content into your site or however you deliver it, now it’s gonna flow. If the content flows effortlessly, then you can work on the user experience and a bunch of the other components knowing that piece is solid. 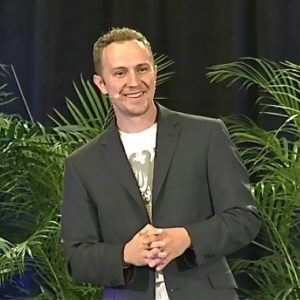 Chris Badgett: What I recommend you do right now is press pause if you’re listening to this podcast or if you’re watching it on YouTube and go do this exercise. That’s incredible, Micah, thank you for sharing that. I think that’s super powerful and it’s a hue problem in our industry of, it’s called the curse of knowledge or expert-itis where the expert sees the map, sees the territory, but has been too close to the material, forgot what it’s like to be the bug in the rug, going through one piece at a time. That’s a great way to develop empathy with the end user and really get in their shoes. And I think you’re right, with a physical index card in your hand, it’s very different from a mind map on a giant white board. It forces you to look at each chunk, each learning chunk, as it comes through. That’s really helpful, thank you for sharing that. Micah Mitchell: Yeah, you’re welcome. Chris Badgett: I think you also mentioned something where when you’re looking at those individual chunks and you know this particular step where you’re in the course and you’re asking somebody to do something that might feel overwhelming or they’ll be tired after they do it or their brain’ll be tired because it requires some critical thinking or developing some new skills or something, that’s a great time to add a little personalization where somebody could, let’s say, complete a lesson in Lifter LMS and apply a tag that then goes through Memberium to Infusion Soft and does some kind of sequence or campaign that’s designed literally around supporting the user at the exact moment that they’re gonna be tired or stressed out, or maybe they need a little extra push to complete whatever that lesson’s asking them to do. I think that’s a great, I think going through the course as a user on cards, it really cements that and gives people the opportunity to not just design content but to design experience. Micah Mitchell: Yeah. And it’s a lot easier to change out an index card than to go re-film a video or change a page or whatever. It’s that kinda pre work that saves time in the end. Chris Badgett: I think I’ve heard from somebody in the writing world, the non fiction book writing world, that they spend half the entire project just working on the outline. This is kinda like that, when you do the index cards, and you really get that right before you actually get a bunch of software, start recording videos. It flows, like you say. You can do the work up front, otherwise you’ll be playing catch up. Do you have any more thoughts on that flow? The reason I bring that up is I see course creators, membership site builders, get kinda stressed out, or they have all these different … I call it the five hats problem, that I’ve said on this podcast many times about trying to balance the skills of an entrepreneur, a teacher, a technologist, an expert, a community builder. But when you’re in flow as a course creator or a membership site builder, you need flow, because you got a lot of work to get done, and you gotta figure all these different things out. What do you recommend, or do you have any thoughts there on helping people doing these types of projects stay in flow or find flow when they need to do this kind of work? Micah Mitchell: Yeah, I think so. I think a big thing, whether you do it on note cards or not, is making the content chunks small. I’ve done content all sorts of different ways. I’ve done a lot of different membership sites. In some cases I have just said I’ve gotta force myself to get started. I start with video one and then keep going, but then as you get deeper into it there’s so many things to remember, like, “Okay, I made this and that mistake, and I’ve gotta cover for it here and there, and whatever,” and I think, like you brought up, for somebody writing a book if they really have the outline down then writing an individual chapter becomes so easy because you know what came before it, you know what’s coming after it, you understand how it fits in. I think this is that way because the smaller chunks, we talk about how that’s easier for the user to consume. It’s easier for you to create because you can say, “Okay, I’m gonna go create three or four pieces of content, basically I’m gonna take three or four index cards, turn them into a video, which can become a page or a lesson, whatever, then I’ve gotta go do some marketing activity, or I’ve gotta go to the bank, or I’ve gotta talk to this attorney or whatever.” It lets you compartmentalize a little bit, which unfortunately we have to do. If you had all day to create content, obviously that’s ideal, but yeah, when there’s other stuff to do, I feel like having the outline so you can jump in and out of it as needed, and having it in very small chunks so that you can execute where you have the time, that’s a big help right there. For me personally I do like – how to put it – I don’t recommend this for everybody, but I kinda do things last minute, honestly. I like doing a lot of the thinking beforehand, as much thinking as possible and planning as possible, and then usually when it comes down to it and I just have to create the thing, it’ll come out pretty good. But I’ve done it before where I’ve gotta create the thing, and if I haven’t done the prep work, and if I have to create four hours of content in a night, that’s not only a long night, typically the content’s not as good. I’ve gotten better at doing smaller chunks with more planning, and it helps me jump in and out of flow. Chris Badgett: That’s awesome. In this spirit of flow and friction removal, you the listener out there, I want you to listen closely to Micah’s answer to my next question, then also I’d encourage you to hang around until the end of the show. We’re also gonna be talking about some other ways that Memberium is removing friction, making more room for flow through templates. But my question right now with where we’re parked at is I wanna leverage your experience in marketing automation and working with CRMs and building campaigns with tools like ActiveCampaign and Infusion Soft. If somebody’s getting into those tools, what are some of the classic mistakes you see people made, and also – that’s the problem side – but on the opportunity side, what are some low hanging fruit or some good best practices when building out campaigns and things inside of a tool like ActiveCampaign or Infusion Soft? It’s a little bit similar to the note card thing where we’re saying make those first and then go in and build out the tech. A lot of people will jump into a system like Infusion Soft or ActiveCampaign and start populating out campaigns. They’ll map it out and think, “Okay, I’m gonna map out this thing, and then I’m gonna go in and write all my copy into it.” It’s not the worst idea. But if you get really clear on your copywriting and your hook and so forth, and how you’re gonna sell the product at the end, and then you back off one step of, “Okay, I know how I’m gonna sell my product, I can make a sales page,” then you can develop those lead magnets with the sales message in mind. So rather than just developing content and then figuring out how to transition to sell later, the content can be developed knowing where they’re going next and seeding a lot of the main features and benefits of the product, overcoming the objections, so that by the time they get to the sales message, it’s a slippery slide down and it’s really easy for them to buy. I think last time you and I talked, we talked about how people will buy a bunch of technology and be like, “I’m ready to make a membership site.” I think it’s the same in the marketing world. “I’ve got this tool and this tool and this tool and I’m ready to market,” versus you find somebody who’s a great salesperson, and they’ll make a sale with the crappiest marketing tools that there are. They’ll make more sales. I know somebody who had started a membership site, and their website was actually a PDF. They didn’t know how to make a website, but they knew how to make a PDF, and they hosted it, and they forwarded their domain to their PDF, and it was basically just a sales letter. And they did great. For me, even though I love the marketing automation and the tech and whatever, I’ve always thought that starting at the end and working backwards is a lot easier than starting at the beginning. It does take a little extra thought, but a lot of people, what they’ll do is they’ll build that front end so much, kind of in a way avoiding avoiding the sales thinking and the sales process, and they’ll do it at the end, and sometimes realize, well a lot of that front end stuff doesn’t really feed into this well. When they do finally figure out what will sell and how, they then have to go back and redo that stuff. A friend of mine, Kim Snyder, she talks about reversing the funnel, which is kinda what we’re talking about, so folks on the bottom of funnel stuff too, your final sales message, what’s that going to be, then taking the steps up from it, then when you do finally connect it to your traffic, things flow pretty well. It does work both ways, both can be successful, but when thinking about all the automation tools, they can be so overwhelming. Getting really solid fundamentals is gonna help the whole process. Chris Badgett: I agree with you that copywriting is the super skill. It’s just so important for a course creator, and not just for sales and marketing. It’s also just how you communicate with your students. It’s a communication skill, it’s not just like how to sell with words. That’s what it’s classically known as, but just the skill is … What I’m saying is it’s relevant to you as a teacher, not just as an entrepreneur who needs to sell things. Micah Mitchell: Yeah, good point. Chris Badgett: I wanted to ask you, as you’ve been around a lot of membership sites, how do you define membership site versus online course? One of the reasons I’m asking is there’s also a concept of a membership site, and you could do content planning where it’s a membership with monthly fee, and it’s like members only, private blog posts that aren’t necessarily structured into a course. But how do you define those two worlds? Micah Mitchell: It’s kind of not even quite a fine line, it’s more like they have overlap, right? Membership to me, a lot of the timing, subscription, it doesn’t always have to mean subscription. But when you build a course for a one time fee and you’re delivering that, it’s a little different than a membership where you have a monthly or an annual or whatever type of fee where now you have to continuously deliver. Even if they come in and month one is great, or the core program is great, what else do you have to keep them on longer? From a normal sales and marketing perspective, most people realize, hey, it’s better to sell more to my existing customer, it’s easier or cheaper to sell more to my existing customer. Membership is that built in, right? It’s subscriptions. There’s so many things you can add besides just content. So even somebody with a course – in fact, I usually think this way about my stuff – is I sell a membership where the course is more just the beginning of it. It’s kinda like the course is almost a bonus, or the core curriculum is something to fall back to and lean on, but what the membership includes is some sort of ongoing component, and there’s a lot of ways to do that. I’ve in the past done a monthly webinar and realized at some point that becomes a mistake, because you … At least for me I ran out of stuff to say. By month 25, it’s like what is this webinar supposed to be about? Chris Badgett: Some people call that the content treadmill. You have to be careful. [inaudible 00:27:09] situation. Micah Mitchell: Yeah, it’s horrible. I know from personal experience. It was like, I’m supposed to come up with something. There’s nothing to come up with, and I feel terrible if I’m just rehashing or watering down. So yeah, that’s something to avoid. What I do like, and we do now, is things like office hours, or an open Q&A, or hot seats, and things of that nature, where it’s kinda user generated. So rather than you coming up with presentations, with my current membership program we do a Q&A where they send in their questions beforehand, and I put together a slide deck where slide one is the question the user asked, and the slides that follow it are the answer, depending on how deep we need to go, and then another slide with a question. That way I don’t … I have to prepare answers to the questions. They’re well thought out, and I’m covering them pretty well. But I don’t have to come up with new topics. I like that model. Some other things, a lot of people know you can include a community with a membership site. For me personally, I don’t, and I don’t recommend people start a community too early. That’s another mistake where they say, “Hey, my membership site’s gotta include all the things this other guru includes, because I’m copying his business model, but for my niche.” The mistake most people don’t realize they’re making is you’re starting at zero, or at level one or two or whatever, and that guy’s already level 10. It makes sense for him to do that. It doesn’t make sense for you to do that until you’re bigger. What I like to do is, again, start with some core content, then the ongoing component habit is user generated as possible. Hot seats are great, where you bring people on and you say, “Hey, so and so’s trying to do what we’re all talking about, we’re gonna use them as a live case study hot seat, and they’re gonna explain all their problems.” What’s fun too, at least the way I like hot seats, is it’s not … If I’m the teacher or whatever, or if you’re the teacher, it’s not all up to you to give them all the advice. Usually, the other people on the call, the other people in the group, have great ideas too. So I like critique certificates. Another variation on that is a 911 call, where you say, “Hey, as a member, during your first year, or if you pay yearly, or after your first year, whatever it is, you get a 911 call, or two 911 calls.” This is where they can book a call with you within … However you wanna set the parameters, let’s say within a business day or whatever, where they can just talk directly to you about whatever their challenge is, or their opportunity. Again it positions your time, puts a value to it. I like putting a criteria on those things where they have to either be a member for a certain period of time or have made it through a certain amount of content. It kind of allows you to still have the one to many, where you’re still teaching courses and doing calls, but it also gives them the one on one that they really do want, just in a very structured, very helpful way with very little of your time invested. There’s probably a lot of other things to include, but those are just some ideas of how to make a course into an ongoing subscription. Chris Badgett: That is awesome. I really love the 911 call. I was taking notes as you were talking for some things to add. I accidentally created a mastermind. What I mean by that is I have a product called Lifter LMS Office Hours, which I set up as a benefit of our largest bundle, called the Infinity Bundle, where we do a weekly call where they can … I go too. It’s a group call for live technical or strategy support. Mostly people are coming with strategy issues, or looking for other tool recommendations and things of that nature. But what ended up happening is, like you said, a lot of the other people on the call had a lot of wisdom and their own experience, or maybe they had used the tool that somebody’s asking about that I haven’t, and it turned into a mastermind. I’ve recently raised the price on that, and I give it the respect it deserves, and I renamed the product from Office Hours to Office Hours Mastermind. That’s my story about how I accidentally created a mastermind. Chris Badgett: I wanted to also just … As you were talking I took a few more ideas down, that if you’re looking to add value to a membership or a subscription beyond courses, you can do some kind of done-for-you service, which is sort of like your critique certificate. You can do virtual events. You could bring in members only special guests, where maybe you don’t have to prepare the presentation, but you’re introducing them to someone who’s really helpful, and whatever the membership is all about. You can do it like a members only newsletter. I’m in one membership that is just a premium newsletter. That’s old school, but that still exists, and it’s a thing. Something that’s really popular these days is a box in the mail, like a crate. Whether that’s like some kinda gear if it’s like a fitness course, or maybe it’s a box of books, or whatever your niche is. I don’t know. Then the other is, I don’t know if I’ve said this already or not, but a book club, I see some people doing, which is … You’re kinda continuing to learn around your space, but then again leveraging the power of the crowd. People show up to a call and discuss what they’re learning from this book and about how they’re applying it in their business or their life or whatever the membership is about. Any other ideas on your side to add value to a membership? Micah Mitchell: I’m sure I’ll think of some afterward. But one that you mentioned that I wanna double down on for people is yeah, having guests come in and help create content with you. That can be so valuable, because we can’t know everything. With the mastermind it’s the same, like you said, you’re not using all the tools out there. When someone says, “Hey, is there a tool for this or that?” And somebody else on the call chimes in and has something, it’s awesome. I think the same with guests. So yeah, I think the monthly webinar, I kinda dogged on it a little bit, but you’re right, it can definitely work if you bring in guests. And you can do some yourself as well, but guests are kinda like the key to making that work really well. Chris Badgett: Yeah. Just to highlight that, I’ve noticed people sometimes have some head talk about that. What I mean by that is, “Oh, that person doesn’t wanna be a part of my membership.” But if you just think about the triple win, like what is a win for you? It’s a win for you to add more value to your membership. It’s a win for your members to have some kind of special guest who can help them on whatever the topic of the membership is. But then the thing that some people don’t realize is that guest is getting access to your paying customers, a good, qualified audience who is interested in what they have to say. That guest may come and bring value, but they probably have some kind of product or service on the back end that if somebody wants to do a deeper dive with that particular guest, maybe buy their book or get their services or products, it’s really a win for everybody. It’s more an issue of just finding good guests and thinking about that alignment. It’s not as hard as it sounds. I just wanted to echo what you said there. Micah Mitchell: Yeah, I love it. Chris Badgett: You said something earlier I wanted to come back to. For the uninitiated out there, in copywriting, you said the hook. What is the hook? Micah Mitchell: The hook is kind of … You could even say it’s the headline, but even within a headline, the hook is kind of the mechanism that really gets somebody’s attention. It’s the thing that makes it sound different. I think infomercials are a great place to go and study. It probably doesn’t sound fun to sit up and watch infomercials, but if you put on your marketing hat and you watch infomercials, some of them or fascinating. It’s things like … I’m gonna do some terrible off the cuff copywriting here. But in fact, actually I’ll go back to a story. This will explain hooks. When I was first selling my Infusion Soft course, I built a course for Infusion Soft users, there weren’t any courses, there weren’t even really Infusion Soft videos, not from the company themselves at the time. And I thought, “This is gonna sell, this is gonna be amazing, I’m so smart for doing this,” right? The first three weeks of having the cart open, I got no sales. Not a single sale. I forget what the original headline was about, “Learn Infusion Soft and Make Money,” blah blah blah kind of stuff. Then I went and studied, I think the guy’s name is Gary [Bensavangah 00:38:34]. I don’t know now to spell that, sorry. But yeah, Gary Bensavangah. I’ve read some stuff about hooks from him. The headline that ended up working, and we did over 100 grand in sales on that thing after doing nothing, and really I just changed the headline, I didn’t change the sales pitch that much, is it said basically, “How a normal, non-techie, everyday guy learned to master Infusion Soft and go on to build a successful company,” or something. The hook there was, “Hey, I’m just like you, but learned to do this,” and therefore the implication is this will work for you. Whereas the other headline of just take this course and make money, or learn to master Infusion Soft, it’s not believable. The hook typically makes something believable and puts it close enough within grasp that people will buy it. I think his example, and I’m just gonna slaughter this, it was about fishing. It was about these kids who were selling worms at a gas station. No matter what they did, like 10 worms for five cents, whatever pricing, whatever kinda stuff, it didn’t work. Then what they said is, “Local worms catch more fish, plus get a secret map to all the best fishing holes with your purchase of $10 or more.” They started killing it selling worms. That’s a hook, local worms catch more fish, and then the secret map is a juicy bonus. This is why copywriting, the deeper level of copywriting, is so important, because in my own experience – and I’ve seen this with clients too – but I know from personal, very personal experience of being desperate to sell something that it wasn’t the course was better or worse, it wasn’t that I included more stuff, it wasn’t that I’m doing the things the gurus are doing, it was that I figured out what my hook was, and that completely changed the sales and the success of that thing. Chris Badgett: I’d like you to press pause and just listen to that again, because that is a great insight into the power of a headline and a hook and copywriting. Thank you for that, Micah. That was very helpful. Chris Badgett: You accidentally touched on one of my most unique curiosities. So I have to ask you, because you brought it up, which is why do software companies – which I think you’ll find this question interesting, because you can see both sides of this – with software companies, it’s usually a third party entrepreneur who makes the best training courses about how to use the software. The courses on how to be successful with software rarely come from the company that makes the software. Why is that? Micah Mitchell: Sorry, I love that question. Chris Badgett: You made Infusion Soft course, right, and you said that the company itself didn’t even have training yet, I think. Or if they did, they maybe had a little bit of documentation or whatever. But you stepped up. I just wanted to ask your opinion on this matter, because I just find this … I see this everywhere with all kinds of software, where these other people make the courses about how to use it. Why does that happen? But someone else creating a course with an outcome in mind by using the piece of software is gonna get a lot more done. Part of the reason I laugh is I hadn’t even thought of it that way, but it’s so true, because even for us, for our Memberium for ActiveCampaign version, when we were piloting it and first getting it out there, we were giving it away for free to beta users and stuff, this guy’s name’s David Power, he created a course about Memberium for ActiveCampaign and was selling it, and doing pretty well with it. We had been doing documentation, but it was funny that yeah, he goes out and creates a course, and people love him. They see him as an expert in that space. But yeah. We didn’t ask him to, he just went and did it, and it’s because he’s got a different perspective. I’ve got so many conflicting things pulling at my time. You talked about the five hats with membership site owners. With the software company it’s probably just exacerbated a little bit, just a bigger issue, 10 hats or whatever. To settle down and get enough space from all of that to really get into the user’s shoes long enough to create a course probably doesn’t happen that often, as much as we both would wanna try. You know? Chris Badgett: That’s awesome. If you’re listening to this out there and you’re stronger on the entrepreneur skill set, but you’re looking for a course idea, look at the software tools. Look at ActiveCampaign, look at Infusion Soft, look at Memberium, look at Lifter LMS, whatever other tools you use, and consider making courses about how to use them. There’s also, on this podcast, there’s an episode we did with Joseph Michael, who his whole course empire was built for writers on how to use the Scrivener software for writing books. He doesn’t work at Scrivener. He made that course. It’s just an interesting phenomenon, so I want to get your take on it. Micah Mitchell: Yeah, it’s so funny. Chris Badgett: As we’re getting close to the end of the show here, I wanted to ask you about some stuff about Memberium. A lot of this episode is about finding flow and removing friction and the power of communication. You recently have released, or are about to come out – when this goes live – are working on a template system. Can you tell us about that, and what friction you’re working on removing? Micah Mitchell: Yeah. When we first came out with Memberium, it was kinda like hey, here’s this tool, and you can do all these things, but there’s no direction. So we came up with the wizard later. I’m surprised people could even make anything when we first came out. We would help them a lot, but just saying, it’s like wow, that was not good. So we came up with a wizard that gives them basic pages, log in page, member home page, update your credit card page, and stuff like that. Those were, I would say, designed less. It was pretty much some text with some short code. They were functional, and they had the right message on the page that a member could publish them and go with it, but there … We got over those initial hurdles. The new system of templates that’s coming out is where we actually got pretty detailed and specific where we’re saying, “Okay, if you’re using …” And we didn’t do every theme in every builder, because that’s impossible, but we took some of the most popular ones. For example, if you’re using Lifter LMS, and the [Elementor 00:46:07] builder and the astral theme, we’ll automatically create you a best practices member home page, where it shows a grid of all the courses, and we mix Lifter short codes with Memberium short codes and components of the builders and stuff. What we’re really trying to do is, we just realized almost everybody wants that. Everybody who makes a site pretty much has more than one course, or their courses are broken up into sections, and they wanna graphically display it in a way that shows the user the progress through, what they’ve completed, what’s still left to go, and make it look nice. That, to do themselves, was a huge chore, especially because they’re not well versed in all these pieces of software. They just want the end result, they don’t want to have to learn all this stuff. We’ve always had the opinion that if people become an expert in Memberium, that’s fantastic, but they don’t need another thing to learn, they don’t want another thing to learn for sure. We’re just trying to take that learning curve out. That is the most complicated page. There’s a lot of other pages also that this new version addresses, but it’s mostly that page when a member logs in, what do they see? Are there check marks, progress bars, what are the graphics like, so we just took all the best practices, because so many people would watch, especially some of the case studies we’d done, and say, “Hey, I want a homepage like so and so’s homepage.” It happened so often that we created the documentation for it, here’s how to build this, and it’s this long piece of complicated documentation. It’s technically accurate, but it’s a whole chore for that person, and the bar keeps getting raised where when they come in and build out the membership site, they feel like they have to have that page functioning and looking good. It’s not really true that they have to, but they just feel like it’s the ante, it’s where they have to be for people to come in and have a good experience. The new system that we have, when you install Memberium, it will detect what LMS are you using, are you using Lifter, what theme, what builder, put it all together, and give you this template right from the get go that then you can customize and modify, but you don’t have to build from scratch. That’s kind of a big, really huge, piece that we’re trying to eliminate so that people can focus more on their content and what they’re delivering and their marketing, rather than so much the technology. Chris Badgett: That’s awesome. I wanna commend you for that. I call that moving the starting line. You’re just moving it further along. You’re removing friction, making it easier for people to get up and going. Micah, thank you so much for coming on the show. For you the listener out there, I would encourage you to re-listen to this one, because there were a lot of gems in here. The content planning with the index cards, the power of copywriting, and hooks, and so much more. This one is worth a re-listen, so I’d encourage you to do that. Go check out Memberium at memberium.com. How else can the listener get ahold of you, or is there anything else you have to say in final to the listener? Micah Mitchell: Yeah. I would say, you know, don’t be a stranger. If you go to Memberium and go to support, feel free to ask anything you want, even about some of these things we went over. We do have some more in depth content and videos we can send them. Even if you don’t use Memberium, feel free to connect with us, and just going onto Memberium and asking a question of support is typically the best way to do that, because we have a great support team who will respond and be very helpful. Chris Badgett: Awesome. Thank you for coming on the show, Micah. I really appreciate it. Micah Mitchell: You’re welcome, thanks for having me, Chris.